In order to claim your property, you will need a case number, evidence tag number or property receipt issued to you by the case officer. If your case is involving felony charges and/or domestic violence charges, you may be referred to a detective or the case officer, prior to the property being released. Please contact the evidence division prior to attempting to recover your property. 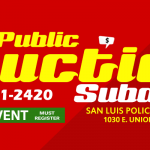 The San Luis Police Department will make an attempt to contact the property owner available for disposition, in an attempt to dispose of the property. All property that is unable to be returned to the owner will be posted on this website for 60 days in an attempt to give notice to the owner. If property is not claimed within the 60 days, the property will be donated or disposed of accordingly. Any person requesting return of property must provide government issued picture identification card.